The Mentor Ice Breakers will head east to New York this weekend for a two-game matchup against the Elmira Enforcers, winners of seven games in a row and currently in second place in the six-team Federal Hockey League with 55 points. The Ice Breakers are on the back end of a particularly tough stretch of five games against the Carolina Thunderbirds and Elmira Enforcers, two clubs that have won a combined 27 consecutive games. To make things even more difficult, four of the five are on the road. Last weekend, the Danville Dashers and Port Huron Prowlers matched up, which wasn’t great for the Ice Breakers considering that those are the two teams Mentor is fighting for the league’s fourth and final playoff spot. Things went about as well as the Ice Breakers could have hoped, though, as Danville won two of three, and neither team dominated the matchup. Against Carolina last week, Mentor held its own but was a bit overmatched against a Thunderbirds club that is firing on all cylinders. Carolina blew the first game open with a four-goal second period before claiming wins of 3-1 and 6-3 to close out the series. Mentor forward Gordy Bonnel earned a point in all three games to push his franchise-record point streak to 17 games. Bonnel is tied for the team lead in scoring with 13 goals and 16 assists, good for 29 points, and has at least a point in 19 of his last 20 games. An Ice Breakers team that hasn’t been at full strength since early in the season will remain a bit shorthanded this weekend. Steven Fowler and Brody Duncan will be unavailable in Elmira after both players were hit from behind into the boards during the Carolina series and suffered concussions. Tim Perks remains out with a knee injury that has sidelined him for most of the season after he collected three goals and an assist in five games with the Ice Breakers in mid-November. Defenseman Joseph Keenan will play this weekend after missing three games with a broken finger. Additionally, forward Vaughn Clouston is cleared to make his return after missing last week’s series with a reinjured groin. Between the pipes, both Derek Moser and John Sellie-Hanson will be active and looking for their first wins of the season against the Enforcers. After this weekend’s games, the Ice Breakers will play Port Huron in what could be a pivotal three-game set. Assuming Mentor keeps pace with the Prowlers in the FHL standings after this weekend, the Ice Breakers could potentially tie or surpass Port Huron and truly make it a three-team race for the final playoff seed. Forward Nate Farrington has registered multiple points in four of his last seven outings, including a two-point effort against Carolina last Sunday. Losing Fowler and Duncan will hurt, as both players are offensive contributors, so players like Farrington and forwards Brett Oldaker (8-11-19) and Patrick Porkka (9-6-15) will need to step up in their absence. The Ice Breakers will have three full lines of forwards to trot out for the first time in quite a while. The return of Declan Conway has been a boost to the Ice Breakers’ offense despite its struggles against Carolina’s stout defense. Conway, a Painesville, Ohio native, has three assists in three games since returning from a broken finger that kept him out of the lineup for a month-and-a-half. The former Lake Catholic Cougar has four goals and six assists for a total of 10 points in 18 games this season. The Enforcers are the only team in the FHL that Mentor has yet to beat, taking down the Ice Breakers in all four matchups between the two clubs. In their most recent meeting, Mentor rallied from an early 2-0 deficit and former Enforcer Joe Swenson netted the game-tying goal seven minutes into the final period before Elmira scored just over a minute into overtime to claim a 5-4 victory. Elmira has not lost since a 2-1 setback at home against Carolina. Since then, the Enforcers have posted four wins over in-state rival Watertown and blew out Port Huron in a two-game set, out-scoring the Prowlers 15-6. In its most recent win over the Wolves, Elmira forced overtime with a couple of third-period goals before Stepan Timofeyev scored one of the most impressive goals you’ll see at any level, picking the puck up with his stick behind the Wolves net and depositing in into the top right corner before Watertown netminder Christopher Marsillo had any time to react. Forward Ahmed Mahfouz, the FHL’s all-time leading scorer with 713 points (243-470-713) in 349 games, is putting up numbers similar to his career average with 2.1 points per game. Mahfouz has a 16-28-44 scoring line over 21 appearances after missing several games due to injury and suspension. Glen Patterson (7-22-29), Timofeyev (9-17-26), and Cameron Yarwood (9-16-25) provide a few nice complementary pieces to Mahfouz on the Enforcers’ offense, which has scored the second-most goals in the league behind Carolina. Elmira is one of two FHL clubs with a positive goal differential at plus-33. Elmira has lost a few players to SPHL call-ups in recent weeks, but it hasn’t seemed to matter on the ice as the team is riding a seven-game winning streak and has won 12 of its last 14 contests. Forward Sean Reynolds (18-21-39), who led the Enforcers in scoring for much of the year, is currently with the Macon Mayhem, where he has already collected four points in four games. Cal Miska is another forward on loan after six goals and 11 assists in 21 outings. Miska, 24, has four penalty minutes and has yet to register a point in five games with the Roanoke Rail Yard Dawgs. Between the pipes, Troy Passingham has carried the load. The FHL veteran has spent the last two years in the SPHL, but he has appeared in 26 games for the Enforcers this year and has posted a 2.89 goals-against average to go along with a .921 save percentage. Ryan Mulder previously formed a formidable goaltending tandem with Passingham, but Mulder is currently playing in the SPHL and has appeared in multiple games for the Quad City Storm and Peoria Rivermen. Nick Niedert, an Iowa native, was signed to back-up Passingham and has yet to appear in a game. Niedert is a 36-year-old veteran who seems to bounce around different teams and leagues every year. He has FHL experience dating back to the league’s inception in 2010 and stints with the now-defunct Elmira Jackals (ECHL) across multiple seasons. Elmira plays a style of hockey that is similar to Carolina’s, based on strong goaltending, solid defensive play, and an overwhelming forecheck. 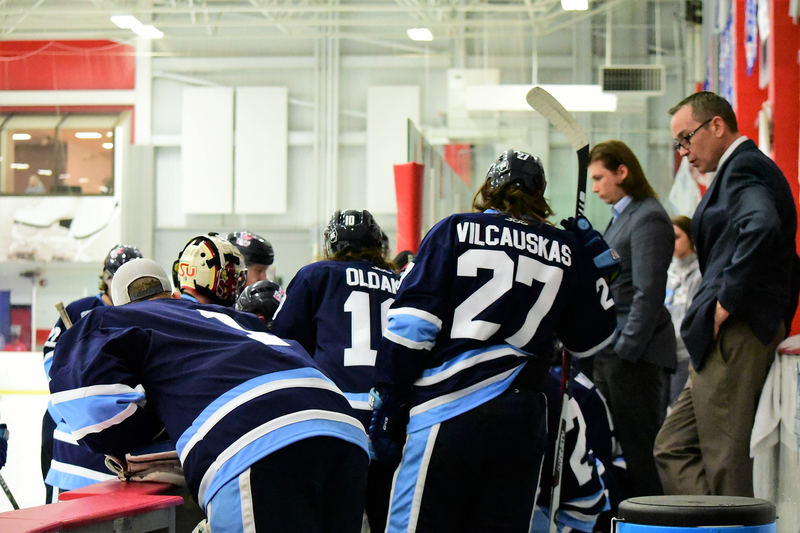 The Enforcers have had the Ice Breakers’ number this season, but Mentor, although it is still missing some key pieces, will be healthier than it has been in past games against the Enforcers. Under new head coach Rod Davidson, Danville won two of three games in a home series against Port Huron to surpass the Prowlers in the FHL standings. The Dashers erupted for 15 goals over the course of the series, which is surprising considering the team has had a tough time putting the puck in the net since its roster was purged through injuries and SPHL call-ups. Danville will have its work cut out for it this weekend as it plays host to Carolina in a two-game set. Watertown’s struggles continued last weekend with a pair of losses to Elmira in a home-and-home series. The Wolves put up quite a fight in the 5-3 and 4-3 losses considering some of their recent roster changes. Having FHL leading scorer Tyler Gjurich (30-26-56) helps stabilize things, but forward Gavin Yates, a former Commissioner’s Cup Playoff MVP, was called up to the SPHL’s Pensacola Ice Flyers. Additionally, goaltenders Cody Karpinski and Cody Porter, who carried the Wolves for the 2018 portion of the season, have yet to put on a Wolves jersey in 2019. Porter, 21, has been up in the SPHL with multiple teams since New Year’s Eve. Karpinski has been injured for the entire month of January but appears to be back to full strength and is listed on Watertown’s active roster. The Wolves will take on Port Huron at home this weekend in a two-game set. Next weekend, the Ice Breakers will play three games against Port Huron in an interesting order. After the two clubs battle in Michigan on Friday night, the Ice Breakers and Prowlers will travel to Northeast Ohio for the second contest on Saturday evening. The series will then wrap up on Sunday afternoon back in Port Huron. On February 15-16, the Ice Breakers will host Carolina in a pair of games.